Wereley with vibration and shock mitigating seats applied to fast boats developed with Techno-Sciences for the U.S. Navy. Norman M. Wereley, the Techno-Sciences Professor of Aerospace Engineering, will take over as chair of the Department of Aerospace Engineering on April 15, 2012. He replaces current chair and professor Mark Lewis, who will lead the Science and Technology Policy Institute at the Institute of Defense Analyses. "Dr. Wereley will bring to his new position the strengths that have made him so effective as the department's director of the Aerospace Engineering Honors Program, director of facilities, and former associate chair," said Clark School Dean Darryll Pines. "During his time in these roles, he has strengthened the laboratory facilities in the department and reinvigorated the Undergraduate Aerospace Engineering Honors Program, all while continuing to lead a most productive research program." A faculty member at the Clark School since 1991, Wereley has a B.Eng. from McGill University, and M.S. and Ph.D. degrees from the Massachusetts Institute of Technology in aeronautics and astronautics in the field of control theory. He is currently the director of the Smart Structures Laboratory and Composites Research Laboratory. He has published more than 140 journal articles, 10 book chapters and 10 patents. He is editor of the Journal of Intelligent Material Systems and Structures, and serves as associate editor for the AIAA Journal and Smart Materials and Structures. 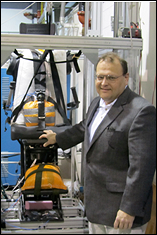 Wereley is the recipient of the AIAA Sustained Service Award (2010), the AHS Harry T. Jensen (Team) Award (2011), and the ASME Adaptive Structures and Material Systems Prize (2012). He currently serves as chair of the SPIE Smart Structures/NDE Symposium (2012 and 2013). He is a fellow of the American Institute of Aeronautics and Astronautics, the American Society of Mechanical Engineers and the Institute of Physics.